BUILDING OF *SOUTHEAST EUROPEAN* UNIVERSITY IN TETOVO TO START. By uncovering the panel where the campus of the Southeast European University was presented, Max van der Stoel, president of the international board and OSCE Commissioner on national minorities, Sunday marked the start of the realisation of the project of the University in Southeast Europe. Stoel thanked for the assistance and encouragement of the Macedonian government and the diplomatic corps, and he said that the realisation of the project would continue with same intensity as hitherto. "At this point, there are no signs for starting of the construction of the campus, but I believe that it will start and will be finished in a very short time. The new institution will be unique in many things. The new university is open for the world. European studies will be the main part of the curriculum, because Macedonia has European location. The new university is finding ways for co-operation with other universities, especially the University in Skopje," Max van der Stoel said. Ljubcho Georgievski, Macedonian Prime Minister, Bedredin Ibraimi, Vice-President of the Government and Minister of Labour and Social Welfare, Srgjan Kerim, Minister of Foreign Affairs, Nenad Novkovski, Minister of Education, Ilijaz Halimi, Vice-President of the Parliament, officials from the Democratic Party of Albanians, representatives of the diplomatic corps, eminent persons and citizens participated at the ceremony. Ljubcho Georgievski, Macedonian Prime Minister, said "the new university will solve the problem of the higher education of Albanians in Macedonia and it is a new test of the trust between the Macedonian and Albanians in the country." "We cannot but to face the fact how artificial was the dilemma which was discussed for years whether the higher education should be public or private. The pragmatism has won and it is important to have higher education for the Albanians in the Republic of Macedonia, and this project enables this. In the dilemma private or public university, I am certain that the new law on higher education will stimulate the existing public faculties to be privatised," Georgievski said. Prime Minister called as he said "bearers of the civic initiative of the former higher education in Tetovo to finance this initiative and all together to eliminate all dilemmas before the citizens." "In that context I think this will help the professors and firstly the students." Georgievski stated. "I want to promote that in the governmental plan for this year, from the resources of the sell of the Telecom, two new high schools on Albanian language and ten elementary schools are planned to be constructed. And I think that it will fill the gap that existed between the elementary and faculty education." He expressed satisfaction "that the Republic of Macedonia shows that it can fulfil the goal by a fight in the institutions." Zamir Dika, president of the national board of the university of Southeast Europe said that this university is not something new and challenge for us but also for the whole region. "We are convinced that the university will start to work on October this year," Dika said. Alajdin Abazi, director of the project and future rector of the university presented the campus comprised of five faculties, which will have 33 training facilities, a library, a big amphitheatre, three dormitories, five buildings for professors and administration, and a computing centre with 500 computers. "Studies will be lectured on English language. If we are lack of professors it may happen several subjects to be lectured on Macedonian language, except two subjects that are projected with the law on higher education," Abazi stated. The construction of the university will start on March 1, 2001 and will be finished for two to three months. 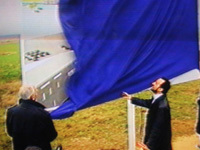 The expectations of the creator of the project are that the university will start to work on October 1, 2001. MACEDONIA, YUGOSLAVIA TO SETTLE BORDER QUESTIONS WITHOUT KOSOVARS. Foreign Minister Srdjan Kerim said in Skopje on 11 February that his government and the new Yugoslav authorities have nearly completed work on defining their common border, dpa reported. He added that he expects the final document to be ready for signing at the 22 February Balkan summit in Skopje. Speaking to reporters, he refused to comment on reports that Kosovar leaders wanted to be included in the talks. Kerim added: "I do not know what relevant political factors from Kosovo could take part in talks on the border, because that issue is settled between Macedonia and Yugoslavia, according to international norms."